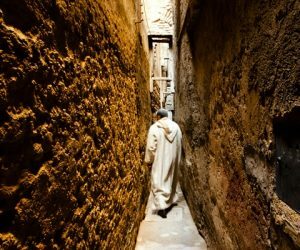 This trip is completely unique and involves staying in 3 different Moroccan tents over 3 nights. It is an intense insight into the Berber life of Morocco and also enables you to experience the ultimate luxury hotel in the Atlas Mountains. 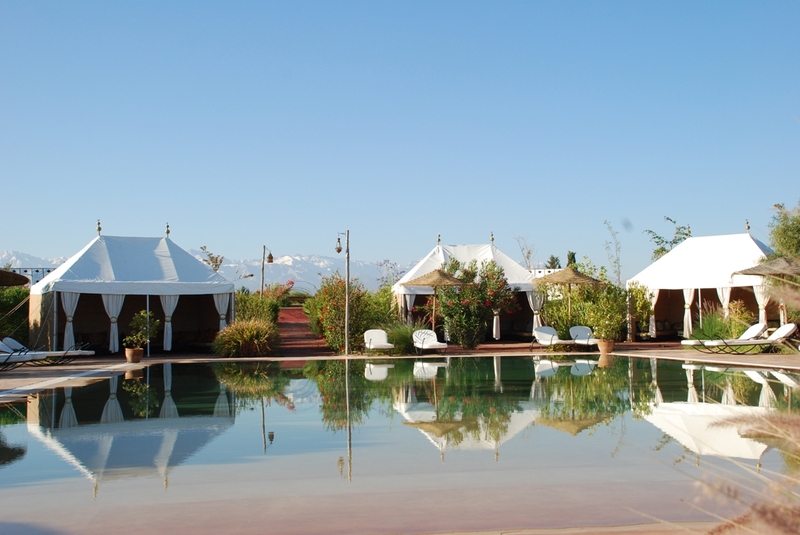 Tented accommodation plays a strong role in traditional Arabic and Berber culture born out of their nomadic history. Bizarrely the least African night will be the day you see the most unspoilt examples of Moroccan life but every night is something special. 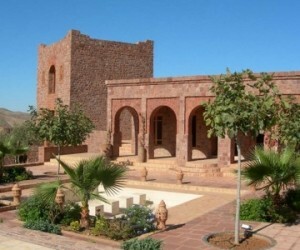 This trip concentrates on the close proximity of Marrakech. Ideal for those who prefer more rural location. 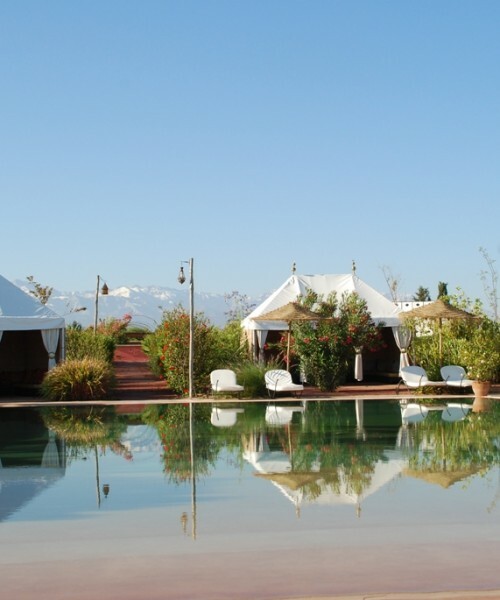 Its starts with a night at Jardins d’Issil around 40mins from the airport, you will then be transferred to the High Atlas Mountains for some trekking and an overnight stay is a simple mountain tent. 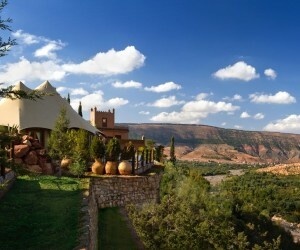 Finally enjoy some real luxury at the Kasbah Tamadot located at the foothills of the mountains. Arrive at Marrakech airport where your driver will meet you and take you straight to Jardin d’Issil. Around 30 minutes from the centre it is set in beautiful gardens around a fabulous pool and best of all you sleep in smart “Arabian Nights” tents, although in many ways they are more like hotel rooms with air-conditioning and en suite bathrooms. 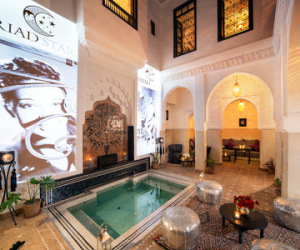 Relax by the pool after your journey or take a trip into the centre of Marrakech to visit the souks. Tent Note: These are based on Caidal Tents which were traditionally set up in the gardens of rich Moroccans’ villas for accommodating and entertaining visiting dignitaries. They are traditionally white fabric with dark leather applied to both decorate and strengthen. After breakfast it is time to don your walking boots and your driver will take you up into the mountains to meet your guide and then off you go into the villages and farms. Your bags will be carried by mules and you will meet up at the pre-arranged camping base. The location of this depends on how much walking you want to do. 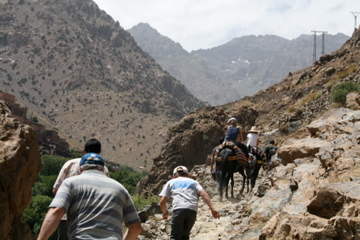 It could be as high as 3000m at the Toubkal base camp or a lower, less strenuous route – it is up to you. 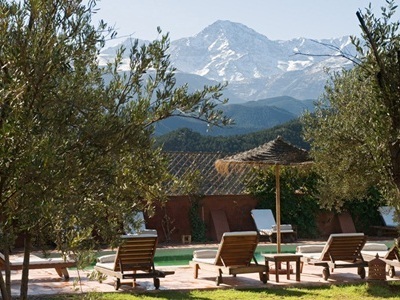 Following your night in the mountains, you head back down to the base at the village of Imlil (again you decide how much walking) for the rendezvous with your driver and the short trip to Kasbah Tamadot, Richard Branson’s famous Atlas Mountain luxury retreat. Here you stay in your third tent, a cavernous luxury suite with a private terrace and plunge pool looking out over the peaks you may have just conquered. We suggest you arrive for lunch and then book a spa treatment or two for the afternoon and then a sumptuous dinner on the terrace restaurant. After all, you are going to have to go some to replace all the calories. You will sleep like a log. Day 4	- Home James! Your driver will collect you for the short trip back to the airport and your flight home. We guarantee that even though this is only a long weekend, the memories and experiences will leave you both invigorated and relaxed…and also you will feel that you have been away a lot longer then 3 nights. This itinerary costs £1240 for a couple for 3 nights (£620 per person). In simple terms this breaks down as £100 for the first night, £10 for the second and £1000 for the final night… It includes all private transfers, B&B accommodation and lunch and dinner up in the mountains. Treatments and other meals are extra and flights are not included but can be arranged. The trip can be done at any time of year although spring and autumn are the best for temperature and weather. Of course it also works well over a longer period and you might consider including an ascent of Mount Toubkal, the highest peak in North Africa. Finally, if this whets your appetite then there are some other Moroccan tents you should try…those under the star-studded skies of the Sahara desert – contact us for details.